Peanut butter and chocolate. Does it get any better? For many of us, no, it does not. A classic salty and sweet combination that is a big fat winner every time. Peanut Butter and Chocolate. Loaded. This was all he said to me. I knew what it meant. He didn’t want a skimpy sandwich. Push the limits of the sandwich. See how much it could hold. I put as much in it as I could without busting the bread apart. That was what PB&J Loaded meant to us. I transferred that concept to this recipe. How much chocolate and peanut butter could I stuff into this brownie without busting the brownie (and my brain) apart? I’m proud to say the brownie holds its own, it’s firm enough to stand strong, but it’s still fudgy and decadent. The peanut butter chocolate topping is soft and creamy, and nice contrast. In short, I could eat the whole pan of these. I haven’t. Only because that might bust my brain apart! The best part? I don’t think anyone would miss the dairy, refined sugar, or wheat/gluten flour. Plus, they are simple to make. Just a few ingredients, easy to mix together, bake, let them set and you are good to go. Just be sure you have someone to share them with so you don’t eat the whole pan yourself! 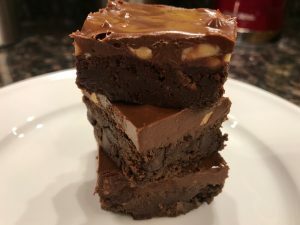 If you want to control the sugar in your brownies to the max, you may choose to use Paleo Chocolate Chunks instead of bought chocolate morels or chunks. They are easy to make! 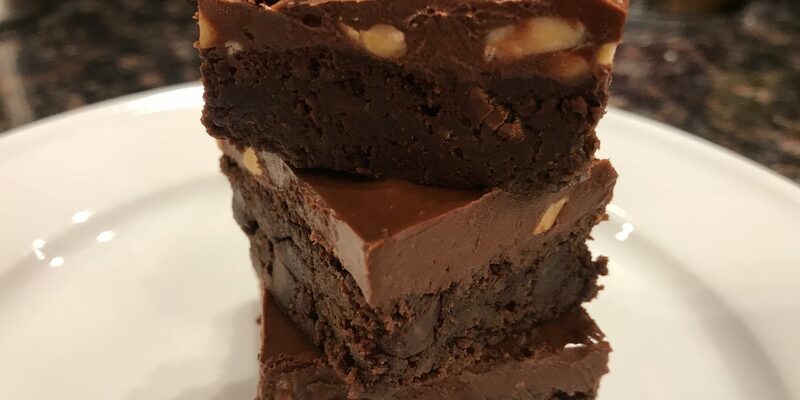 For the Paleo version of this recipe check out Paleo Almond Fudge Brownies! Temper the eggs as instructed in the recipe. When you add the melted chocolate mixture to the egg mixture, add a little to start, completely blend, then add the rest slowly in a stream. Let your brownie base completely cool before adding the topping. You can pop them in the fridge to help the cooling process along, it will go much faster. Don’t make your topping ahead of time. Mix it and pour and spread it over your brownies immediately. Let your topping completely set before cutting. Again, you can pop them in the fridge to speed this up. These brownies (like most chocolate) like to be stored in a cool place. If it’s warm keep them in the fridge. They actually taste great chilled, and even frozen! They also make a great base for a brownie sundae with some vegan ice cream. Yum! Check out my All Purpose Gluten-free Flour Blend Recipe that I use in this recipe! Preheat oven to 350. Line an 8x8" square pan with parchment. Melt chocolate, coconut oil, palm sugar, salt, and vanilla over low heat just until chocolate is melted and all ingredients are incorporated. Remove from heat. In a medium sized mixing bowl whisk egg and applesauce until combined. Slowly pour in a small amount of melted chocolate mixture into egg mixture as you whisk. Continue whisking as you pour the rest of the chocolate mixture in a slow steady stream until incorporated. Gently fold in flour and chocolate chunks until just incorporated. Pour into prepared pan and bake at 350 for 25-30 mins or until set and tester comes out clean. It will be soft and fudgy. Let brownies cool before adding topping. You can pop them in the fridge to expedite the process. Over low heat melt peanut butter and chocolate. Stir until combined. Remove from heat and stir in chopped, toasted nuts. Immediately pour on top of cool brownies. Cut and serve immediately or store in an airtight container for up to one week. They keep best in cool temperatures or in the fridge, taste great chilled, and freeze well for up to 3 months.